The flag of the Church of Sweden (Svenska kyrkan) is a banner of the arms of the said church. The Church of Sweden is a Lutheran Christian church, the biggest religious society in Sweden, and was the state church until 31 December 1999. At least some of the dioceses use flags, as far as I know. They are also using banners of arms. A commonly used flag at churches is the flag of the Church of Sweden. Different sorts of flags seem to be in use. See: http://www.orax.se/produkt_flaggor.asp which shows a 'fassadflagga' and a 'vimpel' plus PMS values. The pictures are clickable (dimensions in cm will appear). Among the articles offered at www.verbum.se are various kinds of flag, too. 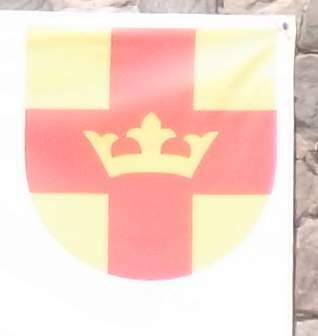 In San Agustin (Gran Canaria) I saw a shield yellow, divided by a red centred cross, which was superimposed by a yellow coronet. The shield was the logo of the Swedish Church. The centre of the shield is attached. I recently saw a flag which was yellow with a white cross. It had the proportions of the flag of Sweden and the colours of the Vatican flag and was displayed outside a Catholic church in Stockholm. It is the flag of the Catholic cathedral, not of the Catholic Church in Sweden. Eva Welin secretary for information"
Editor's note: This information was confirmed by Dean Lars Cavallin on 14 July 2000. The Dean also mentions, that the colours are the clerical colours of gold and silver (yellow and white), the same as for the Holy See (Vatican City State).